Cold weather and a polar vortex blanketed much of the Lower 48 states from January 29–31, resulting in record natural gas consumption in the United States. Estimated total natural gas demand posted a new single-day record on January 30, topping the previous record set on January 1, 2018. Total estimated consumption by the power, industrial, and residential/commercial sectors and total estimated natural gas exports—by pipeline and as feedstock to liquefied natural gas (LNG) facilities—reached 145.9 billion cubic feet (Bcf) on January 30, compared with the previous record of 143.9 Bcf set in 2018, according to data from PointLogic Energy. The polar vortex in the Midwest and Northeast led to temperatures much colder than normal. 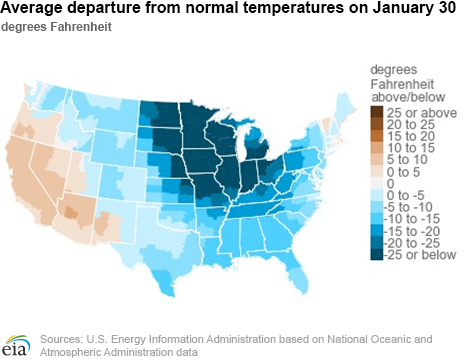 According to data from the National Oceanic and Atmospheric Administration (NOAA), daily temperatures in the Lower 48 states averaged 28° Fahrenheit (F) for the week ending January 31, which was 6°F lower than the 30-year average for the same period and 11°F lower than year-ago levels. The Midwest was the most heavily affected, with temperatures that were lower than normal by 25°F or more for three consecutive days. Estimated use of natural gas by the residential and commercial sectors spiked to 70.9 Bcf on January 30, the third-largest residential and commercial daily consumption of natural gas on record, according to data from PointLogic Energy. The previous record was set on two days in January 2014 during another polar vortex event. This year, a handful of public utility companies in the Midwest issued notices asking industrial and residential/commercial customers to temporarily reduce natural gas consumption during the cold weather event. A fire at a natural gas compressor station in Southeastern Michigan (Macomb County) prompted Consumers Energy—Michigan’s largest supplier of natural gas, serving 4.1 million customers—to ask residential and commercial customers to keep thermostats at or below 65°F when home and at 62°F when away from home. In response to Consumer Energy’s public call, the auto industry halted operations at 18 Michigan plants; keeping an estimated 23,000 employees at home, according to the Washington Post. The requests were intended to alleviate constraints and ensure deliverability to critical infrastructures such as hospitals. Natural gas trade was also affected during the cold weather event. 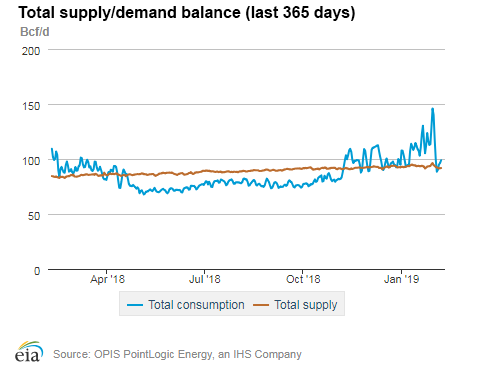 Net Canadian imports of natural gas during the polar vortex averaged 7.2 billion cubic feet per day (Bcf/d) according to PointLogic Energy, an increase of 1.4 Bcf/d from levels in early January 2019. U.S. pipeline exports to Canada decreased, with some pipelines―the Empire pipeline in Western New York and the Great Lakes Transmission pipeline in Michigan―reversing flows and importing natural gas to serve U.S. population centers. The 1.75 Bcf/d Vector pipeline, which had been flowing at or near full capacity the week before the event, only exported 450 MMcf/d on average on both January 30 and 31 from the U.S. Midwest. Natural gas feedstock deliveries to liquefied natural gas (LNG) facilities also decreased by 1 Bcf/d in mid-January from 4.9 Bcf/d in the previous weeks; however, this was primarily in response to relatively mild winter weather in Asia and soft global spot LNG prices. 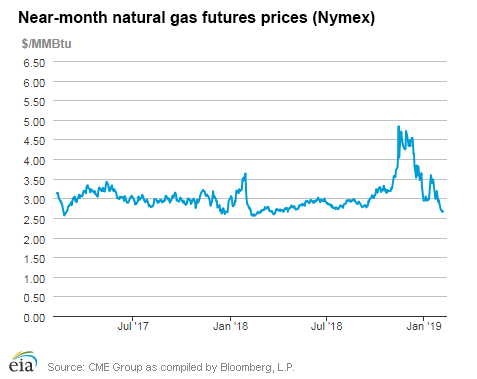 Some delivery day natural gas prices were affected by the weather, although price spikes were more muted than in previous cold weather events. Market hubs in the Midwest and Northeast began to see an increase in spot market prices the day before the polar vortex (January 28). Prices returned close to normal the day after the event (February 1). 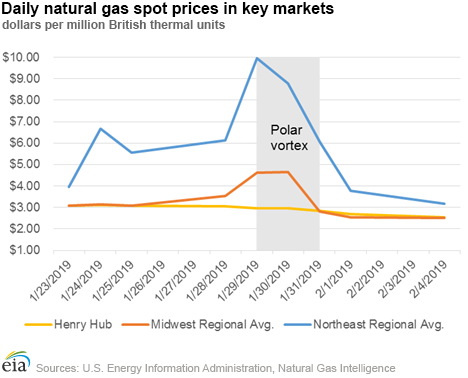 During this period, prices at the Henry Hub national benchmark averaged $2.89 per million British thermal units (MMBtu); Midwest regional prices averaged $3.63/MMBtu, with a high of $4.66/MMBtu for natural gas delivered on January 30; and Northeast regional prices averaged $6.95/MMBtu, with a high of $9.95/MMBtu for natural gas delivered on January 29. Prices at the Consumer Energy trading hub in Michigan were largely unaffected by the compressor station outage, averaging $3.15/MMBtu. Natural gas spot prices fell in the Northeast and Midwest but rose on the West Coast and in the Rockies this report week (Wednesday, January 30 to Wednesday, February 6). 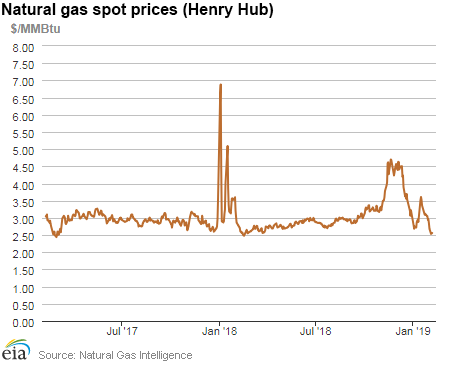 Henry Hub spot prices fell from $2.96 per million British thermal units (MMBtu) last Wednesday to $2.56/MMBtu yesterday. At the New York Mercantile Exchange (Nymex), the price of the March 2019 contract decreased 19¢, from $2.854/MMBtu last Wednesday to $2.662/MMBtu yesterday. The price of the 12-month strip averaging March 2019 through February 2020 futures contracts declined 13¢/MMBtu to $2.812/MMBtu. Net withdrawals from working gas totaled 237 billion cubic feet (Bcf) for the week ending February 1. Working natural gas stocks are 1,960 Bcf, which is 6% lower than the year-ago level and 17% lower than the five-year (2014–18) average for this week. The natural gas plant liquids composite price at Mont Belvieu, Texas, rose by 6¢/MMBtu, averaging $6.72/MMBtu for the week ending February 6. The price of natural gasoline, ethane, propane, butane, and isobutane all rose, by 8%, 2%, 3%, 2%, and 1%, respectively. 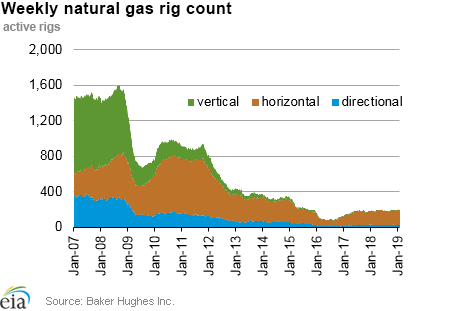 According to Baker Hughes, for the week ending Tuesday, January 29, the natural gas rig count increased by 1 to 198. The number of oil-directed rigs fell by 15 to 847. The total rig count decreased by 14, and it now stands at 1,045. Prices fall in the Midwest and Northeast. This report week (Wednesday, January 30 to Wednesday, February 6), Henry Hub spot prices fell 40¢ from $2.96/MMBtu last Wednesday to $2.56/MMBtu yesterday. At the Chicago Citygate – where prices were heavily affected by last week’s polar vortex - prices decreased $2.41 from $4.99/MMBtu last Wednesday to $2.58/MMBtu yesterday. The polar vortex brought record cold weather to the Midwest and pushed heating demand in the region to record levels. Similarly, temperatures in the Northeast moderated substantially by the end of the report week. At the Algonquin Citygate, which serves Boston-area consumers, prices went down $6.41 from $9.10/MMBtu last Wednesday to $2.69/MMBtu yesterday. At the Transcontinental Pipeline Zone 6 trading point for New York City, prices decreased $10.04 from $12.51/MMBtu last Wednesday to $2.47/MMBtu yesterday. Marcellus-region prices also fell for the report week. Tennessee Zone 4 Marcellus spot prices decreased 55¢ from $2.92/MMBtu last Wednesday to $2.37/MMBtu yesterday. Prices at Dominion South in southwest Pennsylvania fell 58¢ from $2.94/MMBtu last Wednesday to $2.36/MMBtu yesterday. Prices rise on the West Coast and in the Rockies. Cold temperatures and high heating demand have elevated prices on the West Coast. Prices at PG&E Citygate in Northern California rose $7.52, up from $3.71/MMBtu last Wednesday to $11.23/MMBtu yesterday. Prices at SoCal Citygate increased $16.29 from $4.05/MMBtu last Wednesday to $20.34/MMBtu yesterday. Yesterday’s SoCal Citygate price was the highest since early August 2018, when Southern California Gas (SoCalGas) was facing system constraints and hot weather. SoCalGas has issued Low Operational Flow Orders every day from Friday through today, as well as an unusual electric generation curtailment to ensure adequate natural gas supplies. This situation is exacerbated by reduced withdrawal capabilities at its Aliso Canyon storage field, which was already operating at reduced capacity following a major leak in October 2015. The cold weather in Canada and the Pacific Northwest late this report week has also affected prices along the northern border and in the Rockies. Prices at Sumas on the Canada-Washington border rose $18.42 from $3.60/MMBtu last Wednesday to $22.02/MMBtu yesterday. Like in October of last year—following the rupture on Enbridge’s Westcoast pipeline in British Columbia, which imports natural gas at Sumas—reduced natural gas flows have had price effects in the region. Prices at Opal Hub in southwest Wyoming rose $7.01 from $3.69/MMBtu last Wednesday to $10.70/MMBtu yesterday. This is the highest daily price at Opal since February 5, 2014, during a time that featured low storage stocks, cold weather, and forecasts for additional cold weather. Discount at Permian Basin trading hub widens sharply on outage. Prices at the Waha Hub in West Texas, which is located near Permian Basin production activities, averaged $2.37/MMBtu last Wednesday and fell to $0.51/MMBtu yesterday, $2.05/MMBtu lower than Henry Hub prices. This price drop is related to a force majeure on El Paso Natural Gas’s Line 1600 because of a potential leak. This outage restricted westbound flows out of the Permian and pushed the Waha price down sharply, reaching prices as low as $0.09/MMBtu on Monday. Supply remains flat. According to data from PointLogic Energy, the average total supply of natural gas fell by 1% compared with the previous report week. Dry natural gas production remained constant week over week. Average net imports from Canada decreased by 22% from last week as warmer weather reduced the need for Canadian natural gas supplies. Demand declines, driven by the residential/commercial sector. 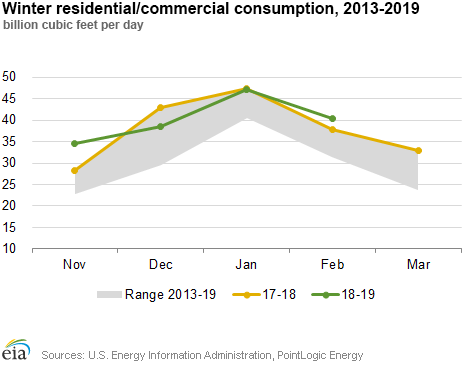 Total U.S. consumption of natural gas fell by 15% compared with the previous report week, according to data from PointLogic Energy. In the residential and commercial sectors, consumption declined by 21% as space heating demand receded. Natural gas consumed for power generation declined by 11% week over week. Industrial sector consumption decreased by 7% week over week. Natural gas exports to Mexico decreased 3%. U.S. LNG exports decrease week over week. Five LNG vessels (three from Sabine Pass and two from Cove Point) with a combined LNG-carrying capacity of 17.3 Bcf departed the United States from January 31 to February 6, according to shipping data compiled by Bloomberg. 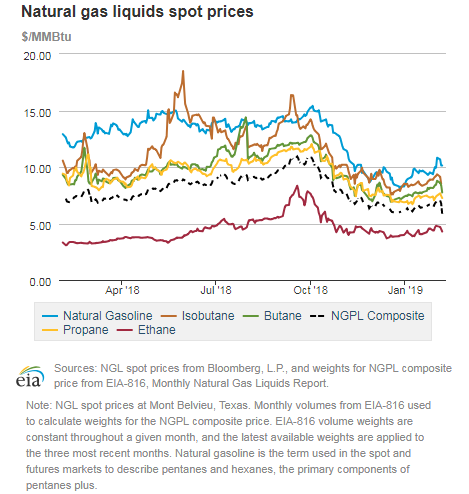 Foggy conditions caused a decline in exports from the Sabine Pass terminal, prompting closure of the Sabine Pass waterway for large ships, including LNG ships, since February 2. The waterway will reopen when heavy fog subsides, according to the Sabine Pilots Association. An LNG tanker, which has been docked at Sabine Pass since February 1, began maneuvers to depart the berth yesterday, indicating that the restrictions may have been lifted. U.S. LNG exports in January have set another record with 37 exported cargoes (28 from Sabine Pass, 6 from Cove Point, and 3 from Corpus Christi), exceeding the previous record in December of 36 exported cargoes. The proposed Golden Pass liquefaction project became the first U.S. export facility among the fully approved liquefaction projects to announce that it reached a final investment decision. The liquefaction facility will be located on site at the existing regasification terminal in Sabine Pass, Louisiana, and will have the capacity to produce 16 million metric tons of LNG (2.1 Bcf/d). The project is expected to be in service in 2024. Net withdrawals from storage totaled 237 Bcf for the week ending February 1, compared with the five-year (2014–18) average net withdrawals of 150 Bcf and last year's net withdrawals of 116 Bcf during the same week. Working gas stocks totaled 1,960 Bcf, which is 415 Bcf lower than the five-year average and 135 Bcf lower than last year at this time. According to The Desk survey of natural gas analysts, estimates of the weekly net change from working natural gas stocks ranged from net withdrawals of 222 Bcf to 263 Bcf, with a median estimate of 247 Bcf. The average rate of net withdrawals from storage is 15% lower than the five-year average so far in the withdrawal season (November through March). If the rate of withdrawals from storage matched the five-year average of 12.7 Bcf/d for the remainder of the withdrawal season, total inventories would be 1,221 Bcf on March 31, which is 415 Bcf lower than the five-year average of 1,636 Bcf for that time of year. More storage data and analysis can be found on the Natural Gas Storage Dashboard and the Weekly Natural Gas Storage Report. *Avg. of NGI's reported prices for: Malin, PG&E Citygate, and Southern California Border Avg. Sources: Natural Gas Intelligence and CME Group as compiled by Bloomberg, L.P. Note: LNG pipeline deliveries represent gas sendout from LNG import terminals. Note: LNG pipeline receipts represent pipeline deliveries to LNG export terminals. 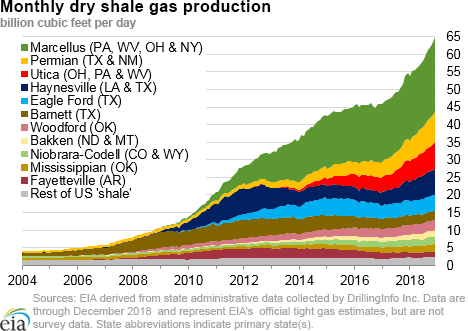 Source: Form EIA-912, "Weekly Underground Natural Gas Storage Report"